The Irish Department of Justice and Equality have recently announced changes that will grant Spouses and De Facto Partners of Critical Skills Employment Permit Holders the ability to work in Ireland without obtaining a Spousal Work Permit. This policy change took effect on 6th March 2019 and will also result in a smoother process for spouses and de facto partners setting up a business in Ireland. The benefits of this change also apply to spouses and partners of Researchers on Hosting Agreements. Previously, the spouses and de facto partners of Critical Skills Employment Permit Holders (CSEP) holders could be granted permission to reside in the State on a Stamp 3 visa. However, a Stamp 3 Visa does not allow individuals to work in Ireland, and many of these individuals have enquired with Company Bureau about setting up a business via Sole Trader or Limited Company but were met with the following limitations. Sole Trader: Residents who are non-EU nationals must have Stamp 4 Visa and a letter of business permission from the Department of Justice to operate as a Sole Trader in Ireland. Limited Company: Samp 3 Visa holders do qualify to be the director of an Irish company, however, as they are not registered to work in Ireland, they would be unable to take a salary from the business. Previously, Stamp 3 Visa holders could submit an application to the Department of Business, Enterprise and Innovation for a spousal work permit in Ireland (Dependant/Partner/Spouse Employment Permit) however, the success of such applications varied. The Irish Naturalisation and Immigration Service (INIS) will now grant eligible spouses and de facto partners to remain in the state on Stamp 1G Conditions which allow them to access to the labour market without obtaining a spousal work permit in Ireland. 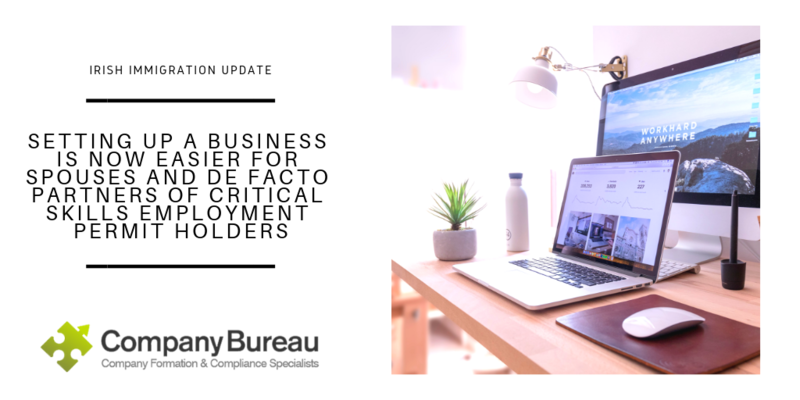 This means that setting up a business is easier for spouses and de facto partners of CSEP holders because they can now earn a wage from their limited company. These changes present new opportunities for Spouses and De Facto residents who wish to operate their business as the sole owner and director. Spouses and de facto partners of CSEP holders who currently resident in Ireland on Stamp 3 conditions can immediately avail of this new system. The local immigration office can update your status to Stamp 1G permissions without the need for a spousal work permit Ireland (Dependant/Partner/Spouse Employment Permit). Dublin residents can make an appointment with INIS in Dublin city centre. Residents outside of Dublin can register at the Garda Registration Office in your local area. Due to a backlog of appointments, it can take time to secure a meeting with the INIS but spouses and de facto partners do have the option to register an Irish company today on their current Stamp 3 permissions. Once their permissions have been updated, they will be able to earn a wage from the business. Please contact our office on +353 (0)1 6461625 or order your company on our online portal, Order Now. Company Bureau can incorporate a limited company for you in as little as 3-4 business days, and assist with a wide range of support services after your business is registered.